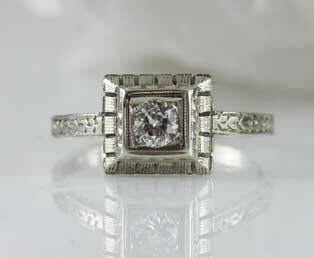 This Art Deco Belais diamond solitaire engagement ring is framed by a square mounting. This estate jewelry ring features a bright white old European solitaire diamond (0.22, SI3, I). This old European diamond is mounted in a beautifully designed square shaped 18 kt ( 750 ) white gold mounting. All four sides of this square shaped mounting have linear engraved designs that are separated by open cut designs. An engraved wheat shank completes the classic beauty of this Belais engagement ring. Geometric designs such as square shapes were popular during the 1920s Art Deco Jewelry Period. This ring was made by the American company, Belais.